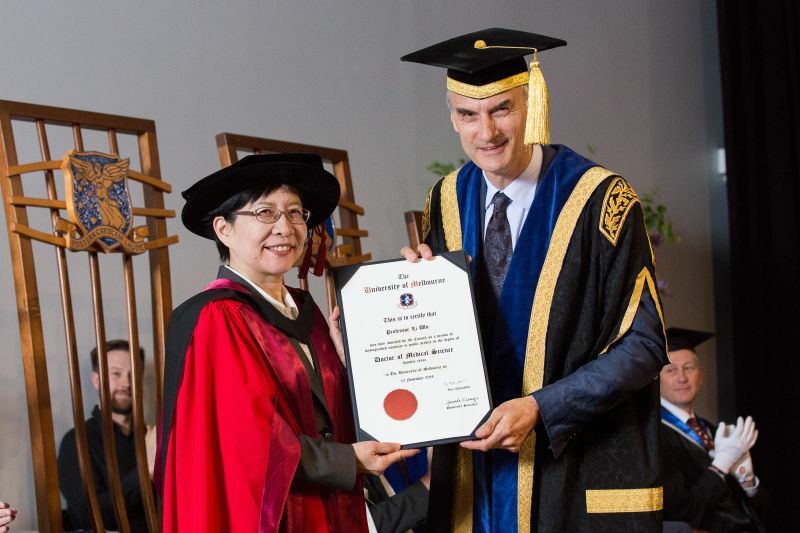 Professor Li Wu is nominated for the degree of Doctor of Medical Science (honoris causa) in recognition of her distinguished contributions to the science of molecular immunology and her farsighted work to build and strengthen academic ties between Tsinghua University and the University of Melbourne. Four years after graduating in medicine from Beijing Medical University, Li Wu was awarded an NHMRC Visiting Postgraduate Research Scholarship and travelled to Melbourne to commence her PhD with The Walter and Eliza Hall Institute of Medical Research (WEHI). Awarded a PhD by the University of Melbourne in 1991, she continued working at the WEHI, making important contributions to the scientific understanding of immune cell development, most particularly in the context of the development and function of dendritic cells. Her scientific and academic contributions have been met with significant acclaim, both in China and abroad. She is the recipient of the Australian Chinese Achiever’s Award for Excellence in Science, the Burnet Prize and the Cancer Research Institute (New York) Clinical Investigator Award in Cancer Immunology. Perhaps the greatest tribute however, was her recruitment back to China, after 23 years in Melbourne, to take up a professorship at one of the top universities in China—Tsinghua University School of Medicine in Beijing—as part of the Chinese Government’s Thousand Talents Plan. The Thousand Talents Plan, established in 2008, is a Chinese initiative to bring leading Chinese scientists, academics and entrepreneurs living abroad back to China and a professorship in this plan is the highest academic honour awarded by the State Council. After her return to China, Professor Li Wu’s strong ties with Melbourne remained, and before long she began to conceive how a collaboration between the two universities might foster academic exchange and collaboration across the two nations and contribute to building the next generation of medical researchers for China. An agreement between the universities, first signed in 2013 and renewed for five more years in 2016, enables medical students from Tsinghua University to spend two years at the University of Melbourne undertaking a Masters of Research. This program also promotes understanding of each other’s research programs and fosters relationships that open opportunities for collaboration between the two countries. Li Wu continues to make valuable research contributions, both through her own work and as an inspirational colleague holding honorary positions at both the Melbourne Medical School and the WEHI. Professor Li Wu is recommended for the award of Doctor of Medical Science (honoris causa) for her highly distinguished contributions to molecular immunology, for her outstanding leadership in establishing strong, enduring links between Melbourne and Tsinghua universities and for initiating an innovative program to build research capacity in health for her own country.